I've been sick for the past few days, but before I came down with some sort of cold flu thing I went to the farmers market in Union Square. There I picked up a big ol' bag of bruised and unwanted apples and pears. I've done this before, since you get about 10-20 apples and pears for $2. Yes, some you have to cut off bits and pieces, but overall they are very good and totally edible. I haven't been eating much since I've been sick, and don't want my fruit to rot or go to waste. 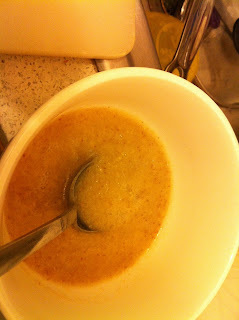 I decided to try my hand at applesauce.. 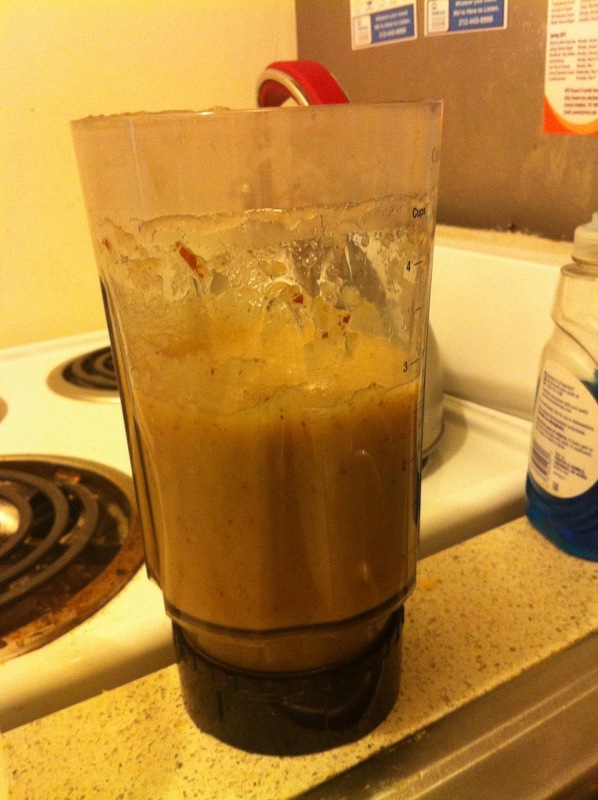 Although it doesn't look highly appetizing, trust me on the fact that it's pear applesauce! I'm back in NYC, after spending a week at home and then two days in Boulder, Colorado. I've never been there before, and it exceeded all of my expectations. Beautiful, friendly, and stunning are good words to describe Boulder. That's a picture from the airplane, to show how beautiful the mountains are, even from super high up. Once we landed my father and I drove from Denver to Boulder, and walked around a bit before getting lunch. We ate at Walnut Cafe, which had vegan food and meat. Just from being in Boulder a few hours, I could tell how nice everyone was. The stunning view of the mountains probably has something to do with that. After lunch we walked around, talked to a few people, and took the city in. I walked along the creek that was near our hotel, that goes through most of the city. After some homework and rest we headed towards Pearl Street for dinner. We picked out Leaf Vegetarian, which is an upscale vegetarian restaurant. I mistakenly didn't take pictures of our dinner, but I did get a picture of dessert. For dinner Dad and I split the autumn salad, and the vegan enchiladas. The salad was one of the best we had ever had. There was spring mix, grilled butternut squash, pistachios, pears, onions, and a maple pumpkin vinaigrette. I definitely want to remake it as soon as possible. Next was the enchilada, which was a mix of vegetables in a corn tortilla with sauce, guacamole, and some sort of tomato thing. Very very good. 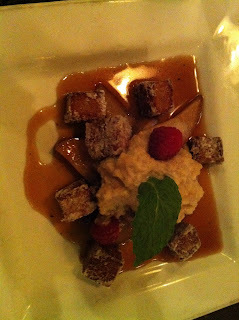 I got the summer fruit salad which was grilled pear, a tofu ricotta, cut up pound cake, and espresso maple glaze. So so good, and very healthy for a dessert. My dad got a flour-less chocolate cake, which he said was delicious as well. After a good nights rest we woke up and explored a bit more. The bottom two pictures are from the parking lot of Chautauqua park, which is at the bottom of the flat irons. There are dozens of hiking trails, and climbing areas around this park. It was an amazing view, and an amazing day to be there. 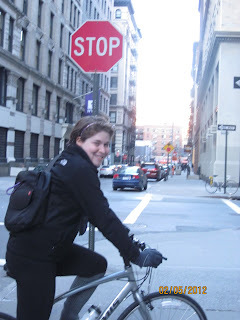 As promised in an earlier post, I'm going to share my cycling adventures that I've been having in New York. I'm riding the 5 boro bike tour in May, in NYC. For anyone who doesn't know what that is (all my west coasters!) it's a 40 miles race through all five boroughs of New York City. It's not really a race however, since 32,000 people ride in it, which makes it the biggest biking event in America. 40 miles isn't a lot, but I'd rather have the ride be easy and fun, instead of hard. Therefore I've been training with two teams. First is the team I'm actually riding the tour with, a women's team called "WE bike". We do training rides, and it's a good community to ride with. I've also been training with the NYU cycling team, which is a racing team. Although I'm not racing with them, I do spin twice a week. I also met a few friends through the team that I ride outside with. I like spin, but I also like getting out and riding outside, along the rivers or in central park. Cycling will never be the same as climbing, but it totally has a place in my heart now. However... my bike is unavailable at the moment, since I'm home! I've been here since late Thursday night, and all I did yesterday was enjoy the outdoors and spend time with people I've missed. I went running yesterday, on a dirt path I used to train for cross country on. Back in NYC, I've been hating running, I dread going out, and I sometimes make up excuses as to why I shouldn't go running. I thought my dread for it was just because I had lost interest in the activity, but I continued since it's a healthy way to exercise. Yesterday when I went running I heard myself running for the first time in months, there were no ambulances, people, cars, honking, or subway trains. I heard myself breath, my thoughts, and the animals and natural sounds around me. When I started my run, I told myself just to go for 10 minutes and I could turn around. Somewhere around the 7 or 8 minute mark, I realized that I was running, on dirt, alone, and peacefully. There were hills, inclines, and declines (unlike Manhattan), but since I was so psyched to be able to freely run, I motivated myself to push myself up the hills and to run faster than I have in months. Instead of making up excuses to why I would allow myself to turn around, I just wanted to keep running and running, soaking in the sun and dirt. I can't believe I forgot how awesome running to run is, and how much the setting really changes those feelings. I'm totally sore today, thanks to running for the first time on hills and awhile, and also the hike I took with my friend in Berkeley. I've never been on this trail, or heard of this trail, but it's one of the best I've seen very close to my house. I think it's called the Claremont trail, or Claremont hill. Basically you climb up a huge hill almost behind the Claremont, and look down and see the ENTIRE Bay Area. It's incredible, hard, but also beautiful at the top. Not a time consuming hike, but most definitely challenging.